Every school child in America grew up learning about Sacagawea. She, of course, was a legendary Native American (Lemhi Shoshone) woman who helped Meriwether Lewis and William Clark on their exploratory expedition from North Dakota across the Rocky Mountains to the Pacific Ocean and back in 1805-1806. Sacagawea was born in 1788 or 1789 around the Salmon River region, in current day Idaho. In 1803 or 1804 she was married to French-Canadian fur trader Toussaint Charbonneau and quickly became pregnant. Why was Sacagawea chosen to embark upon a journey, carrying her infant son, lasting thousands of miles across desolate and often dangerous land? She was bilingual in two very different Native American tribal languages – Hidatsa and Shoshone. While her husband spoke French, English and Hidatsa. This translation chain was viewed as extremely valuable. Lewis and Clark knew they would need help communicating with the Shoshone tribes at the headwaters of the Missouri River. Her work as interpreter proved invaluable and also her presence in the group demonstrate the peaceful nature of the mission. In the year 2000, the United States Mint honored Sacagawea and her contributions to the early explorations of our great nation with the Sacagawea Golden U.S. Dollar coin. The coin was minted under the auspices of the United States $1 Coin Act of 1997. The creation of the new coins were attempting to meet a need for vending machine use. The Susan B. Anthony dollars were popular for vending machine use but the U.S. Treasury's supply of these coins were dwindling by the late 1990s. The act also provided direction to resume production of the Susan B. Anthony dollars until the new coins were ready for circulation. A design contest was used to select the final representation of Sacagawea with her infant son, with the reverse side of the coin featuring an eagle representing peace and freedom. Sculptor Glenna Goodacre's design was chosen and she was paid a $5,000 commission in the dollar coins. The 2000-P coins paid to Goodacre were struck on burnished blanks, which created a unique striking for her set. 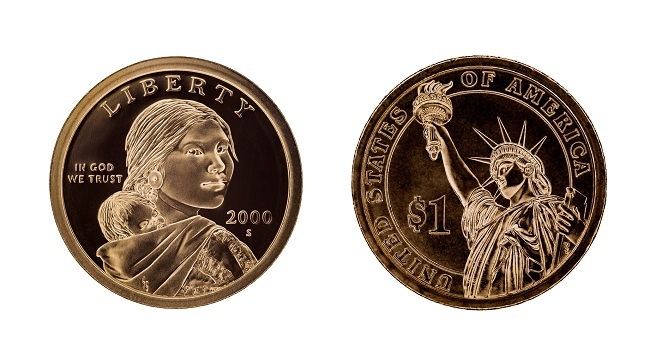 By and large the majority of Sacagawea coins are not rare and circulated coins do not carry numismatic value. They are also not made of gold, despite the golden color. The coins were composed of primary copper (77%), with small portions of zinc, manganese and nickel. The coins still circulate today, but proved to be unpopular with the public and are not widely used. There are a few key dates that are rare and have value beyond the $1 mark on the coin. The U.S. Mint embarked upon partnerships with both Wal-Mart and General Mills to promote the use of the Sacagawea coin in commercial transactions. Remember the days when you'd open a cereal box and get a prize? The partnership with General Mills included 10,000,000 boxes of Cheerios cereal that would contain a Lincoln cent as a prize or a new Sacagawea dollar. Some lucky Cheerios breakfasters would receive a certificate redeemable for 100 Sacagawea dollars. Some of the Sacagawea dollars that were found in the Cheerios boxes were struck from a different set of dies. Within numismatic circles, these coins which showed "high detail" and enhanced eagle feathers on the reverse side of the coin became known as the "Cheerio Dollars" or "enhanced reverse die." These are valuable and depending on the grade have sold for $5,000 to $25,000. Do you have jars of old coins sitting around? Check out any 2000 Sacagawea dollars and search for enhanced eagle feathers. You might find something more valuable than just a dollar. Thank you for this wonderful information. I throughly enjoyed every word.